4 Bedroom Detached House For Sale in Tunbridge Wells for Guide Price £700,000. 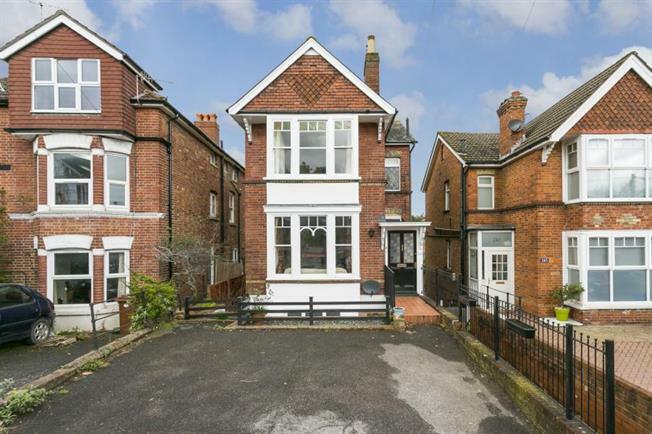 Freeman Forman are delighted to present a charming detached four bedroom Victorian villa offering beautifully presented accommodation arranged over three levels, located in central Tunbridge Wells within a short walk of a mainline railway station. The property offers well presented accommodation and plenty of period features including high ceilings, stained glass windows and fireplaces. The ground floor accommodation includes an entrance hall, sitting room and a master bedroom with en-suite shower room and a walk in wardrobe. The first floor accommodation includes three bedrooms and a bathroom with a separate shower. There could be potential to convert the current loft space into further accommodation subject to any necessary planning consents. The lower ground floor accommodation includes an open plan kitchen/breakfast room, utility room, cloakroom, study, and a dining room with access to the rear garden. The property benefits from a gas central heating system and fine views from the rear of the property. To the front of the property is a driveway which provides off road for two vehicles and there is gated side access to the rear garden which is laid mainly to lawn with a patio area. There is also a small private courtyard garden at the front of the property. The property is situated close to the Royal Victoria Place shopping precinct and the Town Centre with many major national stores, a wide variety of individual shops and numerous restaurants. There are highly regarded schools including separate grammar schools for girls and boys, recreational amenities including a sports and leisure centre, cinema complex, theatre, two golf courses, and two mainline stations with services to London Charing Cross & Cannon Street in approximately 50 minutes. The major road network of the A21 leading into the M25 is again easily accessible to the north of Tunbridge Wells for other national motorways and Heathrow and Gatwick airports.